Self-Contained Ultrasonic Sensor • RPS-409A-2P | Migatron Corp. 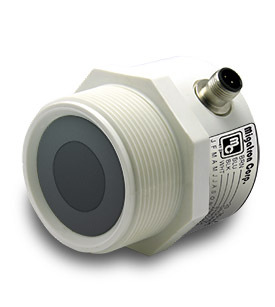 The RPS-409A-2P analog ultrasonic sensor is a self contained sensor in a PVC housing with 2″ NPT mounting threads. It is powered by 20 – 30VDC with reverse polarity protection. The RPS-409A-2P has a short circuit protected analog current sourcing 20 – 4mA output or an analog voltage 0 – 10VDC output. The analog current/voltage is a fixed mA/volts per inch based on the maximum range of the sensor. The RPS-409A-2P has temperature compensation built in to provide accurate readings throughout the entire operating temperature range. The sensor is completely sealed and the connection is made by way of IP and NEMA rated cables. In addition to the power and analog output lines there is also a Sync/Tx line. This can be used for connecting multiple sensors together to prevent cross talk (Sync), or to force the sensor to transmit at a particular time/interval (Tx). The RPS-409A-2P is designed to take advantage of today’s PLC and computer analog input cards. The analog card chosen will determine the resolution of the system. The numerical values that are programmed into the PLC or computer will determine the zero and span. If a set point or set points are required in the application, please refer to Migatron’s SPC-701, SPC-704, or M-1000 control products. Both the SPC-704 and M-1000 can also provide excitation power to drive the sensor. Need help selecting the right sensor for your application? Contact our knowledgeable team for guidance. Learn how our ultrasonic sensors work.